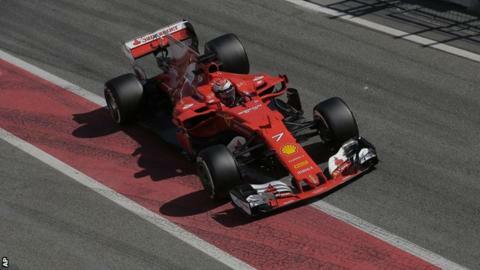 Kimi Raikkonen finished pre-season testing in Barcelona fastest as Ferrari gave notice they could be a genuine threat at the first race in Australia on 26 March. The Finn's lap of 1:18.634 was 0.39secs quicker than the previous best by team-mate Sebastian Vettel and is 0.686secs faster than anything by Mercedes. Lewis Hamilton was fifth fastest, 1.216secs slower than Raikkonen. McLaren-Honda's dismal winter continued with two on-track stoppages. They also endured another day of very limited mileage as Fernando Alonso suffered the same intermittent electrical problem that had caused two on-track stoppages for team-mate Stoffel Vandoorne on Thursday. The Spaniard ended the day with the team's fastest time of the winter - but he was still only 11th fastest and 2.755secs off the pace. And for the third day in a row they failed to complete even 50 laps - the only team in that position. Raikkonen's time was all the more impressive for being set on super-soft tyres - Vettel had used the theoretically faster ultra-softs to set his best time on Thursday. The 2007 world champion, who had a spin in the afternoon that disrupted a race-simulation run, did also use the ultra-softs but was 0.3secs slower than his best lap. Red Bull also showed some strong pace with Max Verstappen second-fastest on a 1:19.438, 0.4secs ahead of Mercedes' Valtteri Bottas. Pre-season testing times are notoriously unreliable indicators of true form because there are so many possible variables in the specification of the cars. But the growing feeling within F1 is that Ferrari may start the season with a genuinely competitive car. "The others look very quick and it looks like we have a good battle on our hands," said Hamilton. "Ferrari have done a fantastic job and I think there's more to come from them. Their pace has really been spectacular. "I don't know if Red Bull have brought their upgrade package here but normally they bring it to the first race. They're definitely still up there. I expect us to be having a real serious battle with both these teams. "I don't know if we can go as fast as them, I really don't. We'll find out. We hope we can, but they've done a fantastic job."